A member of one of Canada’s most distinguished military families, Lieutenant-General William Alexander Beaumont Anderson was born in Montreal. His father, the late Major-General W.B. Anderson, CMG, DSO of Ottawa, was a former Commander of Military District No. 3; an uncle, Major-General T.V. Anderson, DSO, was Chief of the General Staff at the outbreak of the Second World War and a second uncle, Colonel A.A. Anderson, DSO, was second-in-command of the Royal Canadian Signals Training Centre, Kingston during World War II. He received his education at Rothsay Collegiate School, Saint John, New Brunswick where his interest in the military became evident; he joined the Frontenac Regiment at age 13 and entered Royal Military College in 1932. During his college years, he spent two summers training with the Royal Canadian Navy, the first as a Cadet at HMCS Stadacona and the next afloat aboard HMCS Saguenay. Graduating in 1936 and commissioned a Lieutenant in the Royal Canadian Horse Artillery, he was subsequently placed on leave to attend Queen’s University. He then served with “A” Battery in Kingston and “C” Battery in Winnipeg. In 1939 he attended the Artillery Staff Course and was completing the latter portions of this training when the Second World War broke out. On mobilization, he was appointed Adjutant of 3rd Field Regiment and went overseas in December 1939. The following May he was appointed Staff Captain, Royal Artillery at the 1st Division Artillery Headquarters and led the advance party on the abortive trip to Brest, France in June 1940. Several staff appointments at Canadian Military Headquarters, London, followed, as well as attendance at the Camberley Staff College in 1941. He was given command of 15 Field Regiment in 1943. Relinquishing command in May 1944, he served as General Staff Officer, Grade One (Operations) at Headquarters First Canadian Army until his return to Canada in February 1945 for assignment to the Pacific Force (6 Canadian Division) as Deputy Commander, Royal Artillery. The Pacific Force was disbanded before he could take up his appointment. Promoted Colonel in 1946, he was appointed Director of Military Intelligence, subsequently attending the National Defence College in 1949 and his appointment as Director of the Canadian Army Staff College. Later, in the rank of Brigadier, he commanded Western Ontario Area and 1 Canadian Infantry Brigade Group in Germany. In 1956 he attended the Imperial War College and during the years 1957 to 1962 held the successive appointments of Vice Adjutant General, Deputy Chief of the General Staff and Commandant of the Royal Military College. In January 1962 he was promoted Major-General and appointed Adjutant-General, a position he held until the army reorganization of 1964. He then chaired the study group tasked to produce a career management plan for officers and, in October 1965 was appointed Deputy Chief of Reserves. 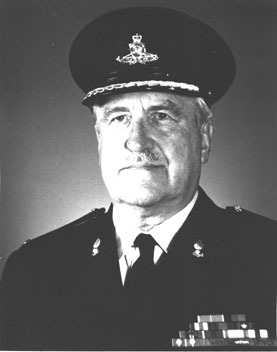 In July 1966, he was promoted to Lieutenant-General and given command of Canada’s army, Mobile Command. Lieutenant-General Anderson was awarded the Order of the British Empire, the Order of Leopold, Order of the Crown with Palm and Croix de Guerre (Belgium) and was Mentioned-in-Dispatches in 1944. On retirement to pension in 1969 he joined the Ontario Civil Service as a Deputy Minister. His appointments included Chairman of the Ontario Civil Service Commission and Secretary to the Management Board of the Ontario Cabinet. He later served as Vice Chairman of the Ontario Inflation Restraint Board. Active in his community, Lieutenant-General Anderson was past President of the Royal Life Saving Society of Canada, served as a member of the Advisory Council of the Niagara Institute and as honourary governor of the National Ballet of Canada. In September 1986 Lieutenant General Anderson accepted the appointment of Colonel Commandant, The Royal Regiment of Canadian Artillery. He relinquished this appointment in 1992 after six additional years distinguished service to the Royal Regiment. With more than forty-five years of service and rising from the ranks to command Canada’s army, Lieutenant-General Anderson has made a significant contribution to his country and his Regiment.